Thread: Miles to the tank? I had a question for owners could you tell me the real world mileage you get from a full tank of fuel. I tend not to trust manufacturers reports. So if any 650 or 400 owners could share their true distances between fill ups that would be appreciated. 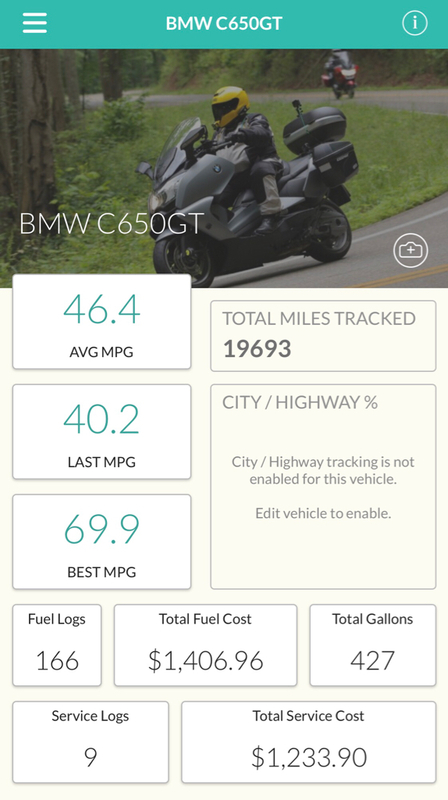 2014 C650GT average of 46.4 MPG after tracking for over 19,000 miles. Mix of around town commuting, week long trips, some 500+ mile days. So about 200 miles to a tank, I had always considered 150 miles my safe range on a tank. 2013 C600 Pretty much all trips are short (less than 20 miles). I get about 155 miles to a tank, but I fill up when the fuel light comes on--haven't ever run out of gas and don't want to...actually just purchased a spare bottle to keep under the seat for emergency use (half a liter). Commuting between Providence and Boston last summer I was getting a consistent 200 miles per fill up, 90% highway.